We had a productive, long weekend. 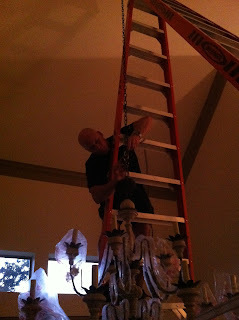 The lights were hung from the ceiling with care in hopes that Mark will never have to go there...again. Well this project was a 12-F*#% project with a couple of moms attached to the expletives at one point (probably would have been worse except for Jack had 2 friends over during the project so Mark was on his best behavior). Mark is available in the Houston market for all of your basic handy-man jobs if you do not mind a foul mouthed worker on your job site. I'm sure it's all worth it! Looks beautiful! Thanks girls for your comments and glad to hear that you had a good laugh from it!! After seeing these GIGANTIC beauties, I will say job well done. It was worth it....cursing and all! They are gorgeous!